The first choice you need to make is about containers. If you have a windowbox and you do not turn it round regularly most of the growth and flowers will be away from the window and towards the outside. This will give a good display when viewed from the outside, but not from the inside. I turn my windowboxes every 2 or 3 days. So if you decide you want to turn your boxes the next thing you have to remember is that they can be heavy. That is why I have restricted myself to plastic windowboxes. If you want to have a good display of flowers from inside as well as outside, and cannot lift heavy weights then it is better to restrict yourself to pots. These can easily be turned a little every day, and this requires very little strength, also there is a greater variety of shapes, colours and sizes. The photograph below was taken early one Sunday morning. The hoverfly was just covered in pollen, and totally oblivious to me while I took the photograph. I like having hoverflies around as it is a joy to watch their skillful flight, and their larvae, though ugly and slug-like, are really just aphid eating machines. So they keep my flowers relatively free of aphids. Clay, plastic, wood, or metal window boxes? it does not break easily, so can stand a lot of bumps and knocks when I turn them. For my pots I choose clay because I like the colours and the glazes, also on natural terracotta I like the weathering patterns. Before you buy anything though it is a good idea to measure the maximum size that your windowsill can take. I know this to my cost having returned home with a lovely terracotta pot that is just a little too wide. 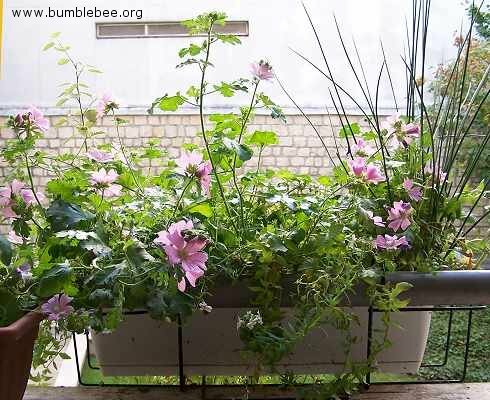 The choice here is between containers that have their drainage trays attached and those that have separate drainage trays. The advantage of an attached tray is that it looks part of the container. The disadvantage can be that you cannot see how much water, if any, has drained through until it starts to overflow. If the overflow will cause a nuisance to others then it might be better to get containers with separate drainage trays so that you do not drip water on your neighbours or passersby. 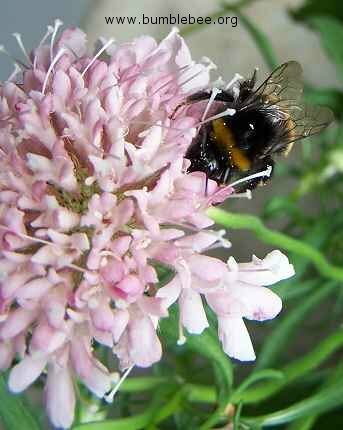 The photograph below shows a Bombus terrestris on Scabious. The scabious was unplanned, and grows in an overcrowded windowbox. It hangs over the side as there is no space, but the bumblebees and hoverflies don't mind. Normally I dead head my flowers, but I am leaving the large seed head of the scabious for the birds to eat in the winter. You will provide the main source of water for your windowbox, so if you are going away, especially during the summer, you will need to either get someone in to water your plants, or set up a watering system. Or you can ask the neighbour above to water them from above! Again nurseries have a huge range. However unless you are growing orchids or acid loving plants such as heathers and rhododendrons, usually the cheapest standard compost is good enough. Many of the composts also contain a slow release fertiliser too, but if the compost has been lying around for a long time it is best to add your own. 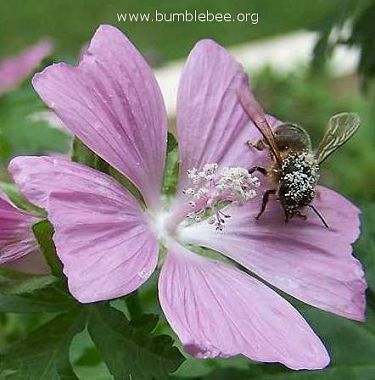 If weight is a problem you can add vermiculite or pearlite to the compost. Garden soil is not usually a good idea as it becomes very compacted after a while, and is very heavy. My overcrowded windowbox that I planted with a butterfly/bee mix of seeds. Just as you are the main source of water, so you will be the main source of fertiliser for your windowbox. And as with composts, unless you are growing something with special needs it is probably best to choose a general purpose fertiliser, or one that promotes flowering. I use one for tomatoes, but more dilute than that required for tomatoes which are very greedy plants. This year I tried one that promotes flowering, and this also produced very good results. Ladybirds are lovely, and provide a great service by eating aphids. 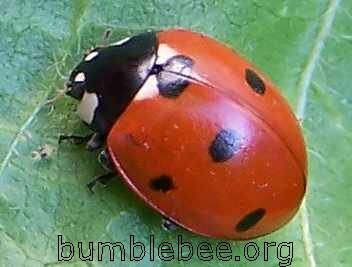 The larvae of ladybirds are usually black with spots and don't look much like the adults at all.